See the Dorena Lake website for additional information. Primary recreational opportunities are listed below. "Very clean restrooms and campsites, excellent employees lots of places to hike to- lovely campsites"
Directions: From Cottage Grove, 6 miles east on Row River Road. Factoid: The lake is located in rolling, partially wooded hill country. Its three parks offer boating, swimming, sailing, fishing and water skiing. Schwarz park located downstream of the dam, offers overnight camping for families and groups. Overnight camping is also available at Baker Park on the south side of the lake. The lakeshore is managed for wildlife habitat as well, including many species of birds and animals. 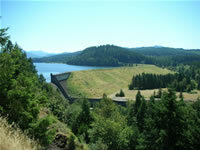 Dorena Dam controls the Row River and reduces flood stages downstream on the Willamette River.